May wait for the reviews on this one…….. Note, this book hasn’t been printed/published yet. Got an E-Mail from Martin saying it’s still about 6-7 weeks out. So maybe around Xmas time. Indeed, in the spirit of the title, Popoff unchains himself from typical bookish flow, creating a guide to make full-bodied mastery of one’s Van Halen catalogue, sending the user and abuser scurrying back to the songs, headphones on, looking for sonic nuggets likely missed the first hundred times passed during too light a repast. - a look at the band’s gold and platinum certifications. Anyone have this one yet. I think Im going to go for it! Out of the blue, my copy arrived today. Wow! I just ordered my copy and I also have a copy of the VH photo book from Japan on order from the VHStore. Cool xmas gifts. Ron, did you have a peek at your Unchained book yet? dand363: Ron, did you have a peek at your Unchained book yet? Sure did. I’m enjoying the prologue, which is an interview with a guy that was present at shows in 1976&77, and even recorded a couple of early days shows. What is the size of the book ? What the…..assumed it was not coming out til December. I ordered mine on Nov. 6. Hoping it shows up soon. Received my copy this morning! Looks good- more on my thoughts once I get a chance to dig in over the coming weekend. Initial thoughts: looks good!!! 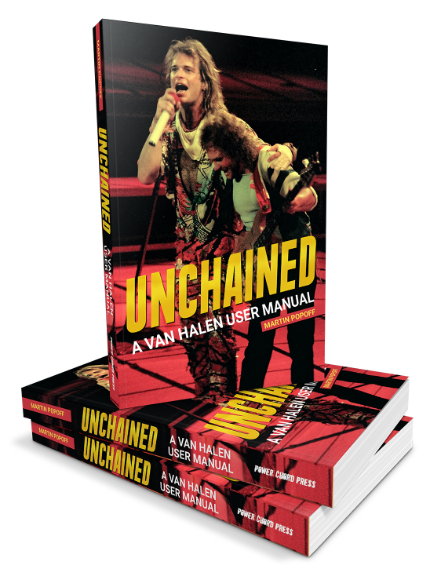 FYI, this book is also available at Van Halen Store, here.